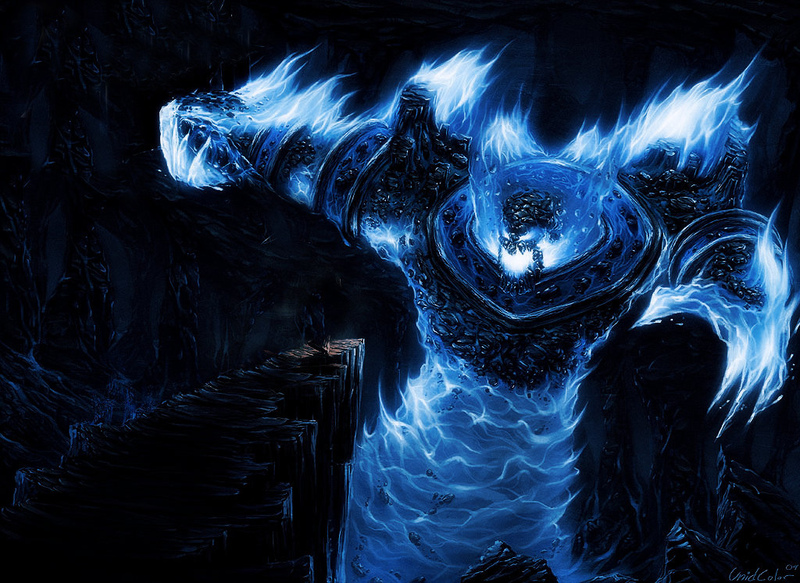 Ancient Apparition is a supportive-nuker hero that can helps the team to win teamfights with his spells. He has global spell that makes him can help his teammates that are far away from his position. He can control the lane, mid, or other lane quite easy. He has cold feet that can harass enemies he face with a mighty damage in the early game. He have a slower abilities for an area that will helps team to chase enemies. Makes you can freeze your opponent can't move away 740 range from his location where he got this skill from you. This skill also deal some dagame per second. A very nice single targetted skill to chase enemy. He will be frozen so you can attack him easily. If you have stunner or slower friends, they can helps you to make opponent can't move farther than 740 range and automatically get frozen. Very good to kill a single target. 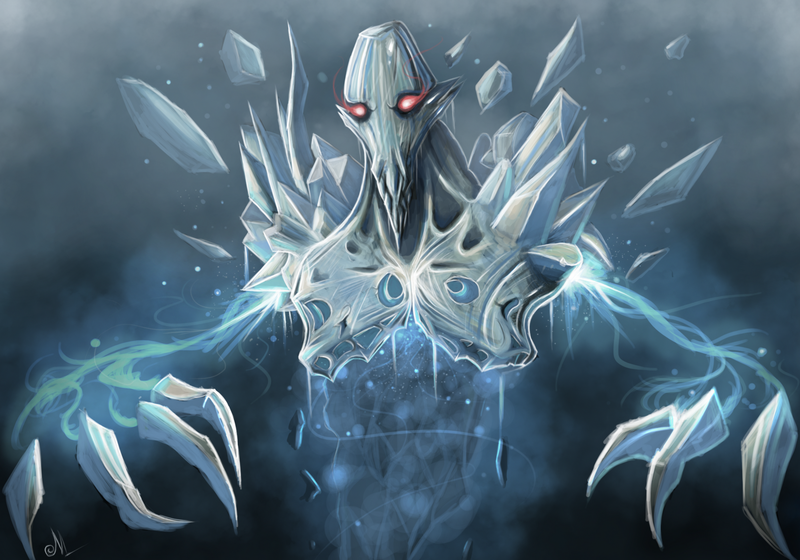 Creates a vortex of icy energy that slows movement speed and increases magic damage done in its range. Lasts 12 seconds. Makes a circle that can slow down any enemy that move into it. Will be good to block enemy with this skill and make him move through this circle because he can only run into this skill if he don't want to be killed by your team, and be slowed. He then have his magic resistance reduced so he will feel more magical damage for every magic he receive. Makes your 1st skill Chilling Touch have more chance to freeze enemy. Because he will have a hard time to move for 740 range. A frigid gust enchants allied heroes, granting them bonus magical damage for a given number of physical attacks, while slowing their attack speed slightly. Lasts 30 seconds. Gives a magical damage to a normal attack, with the cost of attack speed. This skill area is high so if 5 of your teams groups together in an area, all will receive it's buff. Useful in a teamfight where the additional damage will be received from all members, and will deal lots of damages to enemy's team. 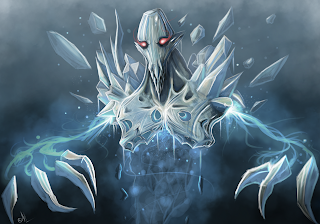 The bonus damage will be increased again from your 2nd skill, Ice Vortex if there are enemies in the AoE of the Vortex. This is your main skill for nuking enemies in the game. This skill gives some magical damage to enemies in it's blast. Will instantly kill enemies below 10,11, or 12% HP, based on this skill level. This is considered a global skill. You can cast this from far away, you can cast this from another lane or anywhere in the map. This skill is rather difficult to knock the enemies. You will cast the tracer first, it's a ball that run straight to the selected area, you can cast stop everywhere between you and your target, its a straight line, and the after you click to stop the tracer, you will cast the next ball that will explode in the place you stopped the first ball. , If you clicked the wrong position to stop the tracer, it will miss the target, your enemy may have just run away from their previous position and you will waste 1 skill. But don;t worry if you miss this skill, the cooldown is quite low, 45 second for an ultimate, you can cast it again in 45 second, its not long time in DotA. Releases the ice blast early at its current location. Release the ball that will explode in the area where you clicked to stop the tracer. Why maxed Cold Feet first? This is your main nuke in early mid game, useful for harassing enemy in lane and will helps in chasing enemy. Chilling Touch or Ice Vortex? Chilling Touch in early game will helps you for easier last hitting and also helps you in harassing enemy, I recommed take 1 level in early game. Ice Vortex will be needed to slow down enemy and makes your team can kill your target, good for mid game ganking activities, I recommend you to maxed this before chilling touch for the preparation of mid game ganking activities. And Chilling Touch have a high manacost so you can't cast this frequently in early game. In late game Chilling touch will helps team to get additional damage in a teamfight. You can take any lane you want. AA can also become a decent solo mid player, if you want to be a solo mid player, it is good for you. Before laning phase, I recommend you to block the creeps. This will make you can attack from uphill and enemies will forced to laning from downhill. Downhill is not favorable because it will makes your attack to miss! more. If you choose to lane in top or bot, you should help your carry players with denying the creeps, don't last hitting. You should harass opponent using Cold Feet and makes him unfomfortable in last hitting. You can also hunt for firstblood using Cold Feet, this skill have a decent damage in early game. In mid game, you should participate in ganking activities. You have Cold Feet to freeze the enemy and Ice Vortex to helps you with a slowing abilities and increasing magical damage. Your friends that have stun or slow will makes your Cold Feet to can Freeze the enemy because he ca't move more than 740 range. You should also use your ultimate to deal damages to enemy you want to kill. This skill have a nice area damage that can kill enemies. If you are far away from the enemy, you can use your ultimate Ice Blast to helps your friends.This skill will deal dmages and helps your friend to get some kill. You need the precision in clicking stop of the Ice Blast, so it will damages to enemy you want and not exploding before it reach the enemy. In late game you should full participate in teamfights. You should cast Chilling Touch while you and friends are grouping before the teamfight. That will makes your friends get additional damage for their attacks. Very good because the damage accumulation will be so high. And the magical damage will be amplified too because of Ice Vortex. Cast Ice Vortex in the crowds of enemies. Also use Cold Feet to 1 target, and make him should move 740 away from his original position, maybe that can makes him should go out of combat. And the most important, don't forget to cast your ultimate Ice Blast, and blast it to the middle of enemies. Maybe you already have some supportive items like Guinsoo Schyte of Vyse ofr Mekansm, use all you have and make sure you give enough support to your teammates. Happy icing! Why Force Staff? ForceStaff is useful on many purposes, you can initiate a teamfight with ForceStaff, or you can save somebody that run from enemies, or you can save yourself. His ultimake makes enemis in a very low HP but it can't kill enemies, it will be capped at 1 HP. That's your job to finish the enemies. Use your ultimate and makes opponents to shatter below 12% HP. You also have slower and an amplifier for magical damage, Ice Vortex, that makes Venomancer's poison to slow more and deal more damage. Carries should be happy to receive your helps in a teamfight, and they should the right click and use all their skills to the enemies.